Last month we told you about a different kind of cooperative effort with EA's Battlefield: 1943. It was called the "Coral Challenge" and the goal of it was to collectively earn 43 million kills in the game between the two platforms to unlock a new map and game mode. I'm happy to report that it's mission accomplished, as of this morning the game eclipsed the 43 million kill mark in just under 5 days. And 3 of those days there were server issues. Update: Apparently it's not 43 million total kills, but 43 million by platform. We've contacted EA for clarification and will update with more details. So despite the rocky start for the game thanks to unprecedented demand and a lack of resources on EA's part, things got up and running quite smoothly over the weekend. 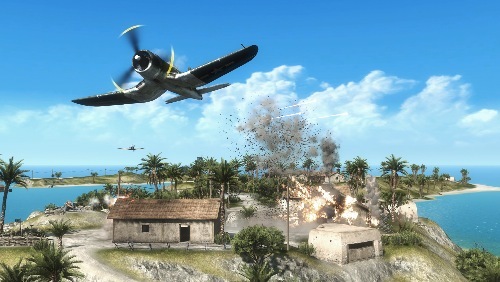 Battlefield: 1943 drops you into the Pacific campaign from EA's classic PC game, Battlefield 1942. Out of the virtual box we have three maps; Wake Island, Guadalcanal and Iwo Jima. These maps were all based on the 1942 ones of the same name, but have been upgraded into the explosive Battlefield: Bad Company engine. Up to 24 players can battle it out, 12 on each side. The first thing the engine upgrade does is it no longer makes buildings a safe place to hide. Explosions are common place in the game and most structures splinter and destroy in glorious fashion. Of course we get upgraded graphics on top of the great physics and destruction. Gameplay has been simplified a bit, removing a support class in favor of regenerating ammo and health. Players can choose from standard infantry with anti-vehicle, Infantry with the ability to repair and a long range sniping class. Each maps has plenty of vehicles at your disposal; tanks, planes, jeeps, and even an entire bomber squadron. A really nice touch in the game is the new squad grouping mechanic which allows you to spawn on any squad mate in the heat of battle. If your squad mate is driving a tank, you'll spawn as the gunner. This helps keep the battles intense and the downtime to a minimum. Battlefield: 1943 is all about team work, and really, it's one of the best team games I've ever played. There's just enough changed and tweaked from 1942 to make this feel like it's own game, but you'll never really feel foreign. There's a new ranking system built in, so as you earn experience in each battle you'll rank up. This doesn't really appear to unlock anything, but it's a nice progression system none the less. There's very little to dislike about this game, especially as a $15 title on the Xbox Live Arcade and PlayStation Network. I think the demand for the game combined with the server issues put in perspective just how popular this franchise is. Almost 10 years later and the same basic formula and maps are still a blast to play. I also guarantee you'll have the theme song stuck in your head for weeks.